The properties of polyurethane formulations. In 2009-2010 I worked at Applied Polymers, Cheltenham, Victoria as a polyurethane formulations chemist. This company made rigid and flexible foams, elastomers, glues and resins. I learned a lot about formulation measurements/changes, measuring physical properties of materials and the handling of high viscosity fluids. I also interacted with fellow staff and many people from outside companies. A Brookfield spindle type viscometer was used to measure the viscosity of both raw materials and polyol blends. Spindles of six different sizes were fitted depending on the viscosity of the substance being measured with lower viscosity liquids needing the larger spindles. This measures Newtonian fluids in centi poise (cP). It was amazing to observe the change in viscosity when particular ingredients were added to a formulation. Large molecule polyols (macroglycols) typically had high viscosity like honey. From this experience, I observed that more hydroxyls on a molecule produce a sharp rise in viscosity, whereas increasing their molecular mass only gradually increases their viscosity. This is why sugars readily increase the viscosity of blood. High blood sugar is unhealthy due to high viscosity blood trying to make its way through fine capillaries in organs and tissue. Most diisocyanates used in the polyurethane industry are made up of a mixture of isomers and have an NCO content of 7-30%. A typical raw material known as 'crude MDIs' was stored in the lab as a viscose liquid using a clean, unused steel petrol tin. In order to prevent a drop of MDI from curing the lid shut, Vaseline was placed around the lid. Opening the lid of a diisocyanate tin typically released a small amount of gas, as the isocyanates had reacted with the H2O in the air trapped inside the can from the last opening to form NH2 and CO2. Blends prepared from crude MDIs and other more exotic diisocyanate raw materials were made and tested on site. Diisocyanates can also exist in a polymeric form known as PMDI which has the advantage of lowered volatility (see image). There are many diisocyanate products available which may be a mixture of different proportions of crude MDIs, pure MDIs and polymeric MDIs. As each product has a different concentration of active NCO groups a simple way to test the NCO percentage is by n-dibutyl amine titration (described below). Old samples could also have their total % NCO measured this way to determine if they were still usable and to assign shelf life to a product. A known amount of n-dibutyl amine in tetrahydrofuran (THF) solvent is added with stiring. The excess n-dibutyl amine is then back titrated with aqueous hydrochloric acid using bromophenol blue indicator to observe the end point and calculate the NCO content. The n-dibutyl amine and tetrahydrofuran must both be completely anhydrous for the test to be accurate. These three tests were measured sequentially on the same sample. The polyol blend is added to a milkshake cup and the appropriate amount by weight of diisocyanate is added to it. The cup was then taken straight to an 800 W powerdrill with spindle attached and clamped in place to point down. The timer was started and the blend mixed by the drill for 2-5 seconds. The spindle was then quickly rinsed in a tin of acetone to keep it clean for the next test. The cup was placed on the bench and watched. The moment bubbles start to make the level of liquid rise is the 'cream time'. The foam then rises toward the top of the cup and outward (see image). The point when the foam stops rising is the 'rise time'. The foam will still be viscoelastic at this point and it is touched repeatedly with the side of a spatula or the tip of a toothpick. When strings can no longer be pulled from the foam, it has reached 'gel time'. The foam tends to remain tacky for a few minutes after the gel time. This measurement was taken 2-3 times and the values quoted in seconds. A typical profile for a foam might be: CT = 37 s, RT = 140 s, GT = 173 s. A beginner at this task inevitably left a mess on the drill & themselves and over filled their cup allowing foam to spill out all over the bench. When an order arrived for a product the factory would make it. A typical order was for 1000 Kg of polyol blend and 1000 Kg of diisocyanate. When the ingredients were blended the factory staff would bring a sample to the lab to have its properties tested. Sometimes this resulted in asking the factory to add a little bit more of one ingredient to bring the batch 'in spec'. Lab workers would walk out to the factory wearing a safety vest and talk with the staff there. The factory floor had forklifts and many different raw materials. Most were kept in barrels high up on racks. Others were kept in 1000 L intermediate bulk containers (IBCs). Some were kept in a high temp storage area (32 °C). Sometimes ingredient bottles in the lab became empty and we would ask the factory staff to help refill from the bulk containers. Some ingredients were low to the ground and easy to open and lab staff could help themselves. There were many tricks to opening containers that were stuck closed. If a container of diisocyanate became contaminated with water and was resealed, it could produce CO2 over 2-3 days and cause the lid to explode off. This test was carried out according to a standard method that used a piece of rigid foam 150 x 50 x 10 mm. The edge of the sample was inserted into a gas flame for 60 sec. It was then removed and the time for the flame to extinguish recorded as well as the number of mm the flame penetrated into the piece. Some ingredients could improve the performance of a foam in this test, such as diethyl ethylphosphonate (DEEP), however when this was increased it tended to reduce the tensile strength of the foam. This instrument could crush or pull a polyurethane sample which had first been cut to size and thereby measure its strength. As rigid polyurethane foams are used as thermal/physical support for LPG and LNG pipelines, a cryogenic chamber was set up around the Instron to measure physical properties at the low temperatures found in natural gas pipelines. Another instrument in the same lab measured thermal resistance of the rigid foams used for fridges and refrigerated trucks. Lower density foams gave the more desired low values for thermal resistance, but these foams had decreased tensile strength (more easily crushed). Existing formulations were typically made up of 4-20 ingredients, mostly liquid polyols. These were added by % mass, so if a compound had to be reduced slightly due to being toxic or expensive, some trial versions were made up with slightly lowered percentages of this ingredient. These experimental formulations were made up in 400 g portions into a 500 mL jar which sat on a balance. The ingredients were added sequentially and some small amounts required great skill to add accurately. 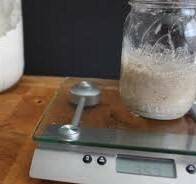 Some ingredients had low boiling points and were added last with the jar quickly sealed to prevent their escape (which would alter the formulation). If an ingredient was accidentally 'overadded' the jar had to be started again. A note on retardation of the urethane reaction by benzoyl chloride. It is well known that the addition of a small amount of benzoyl chloride to a polyol blend vastly increases the cure time of the polyurethane. This trick can be used when a batch has too much catalyst and reacts too quickly. It is also useful when the polyurethane is being applied in a climate with high ambient temperatures. I am often asked the mechanism for benzoyl chloride's retardation of the urethane reaction. I have found very little evidence to answer this question definitively, but I can share two observations. First, it seems to work mainly in polyols which contain amine catalysts. Second, it doesn't appear to me to antagonize the catalyst directly, but rather it stabilizes the isocyanate which lowers its reactivity†; this might be a reduced electro-positivity of the NCO carbon, which is what makes an isocyanate compound more or less reactive. † "URETHANE POLYMERS" by Henri Ulrich, Kirk-Othmer Encyclopedia of Chemical Technology. Published in Wiley online library on 16-Jun-2006.